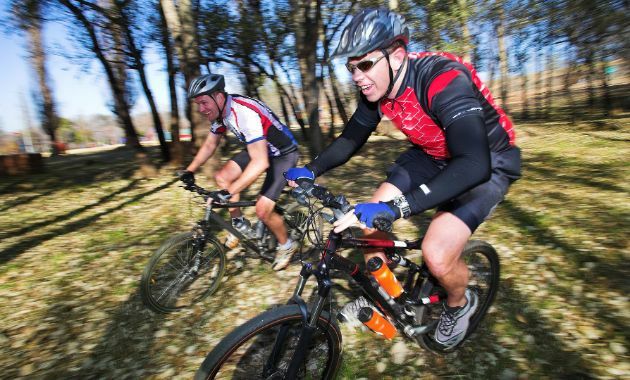 CSU News Latest news Science What’s going on in your brain during exercise? What’s going on in your brain during exercise? A group of cyclists has been pushed to the limit to give CSU researchers new understanding of what's happening in the brain during exercise. A group of cyclists has been pushed to the limit to give Charles Sturt University (CSU) researchers new understanding of what's happening in the brain during exercise. CSU PhD graduate Dr Caroline Robertson examined how the brain operates to regulate exercise, in particular what happens when you reach the point of exhaustion. The research through CSU's School of Exercise Science, Sport and Health examined brain wave activity, brain blood flow and respiratory responses of well-trained cyclists as they were exercising. "I aimed to get a picture of what was happening in the brain during exercise and to see what changes happened that correlated to people reaching a point where they stopped exercising," Dr Robertson said. "We found that when people were motivated to go beyond that point of exhaustion, those key measures of blood flow, oxygen availability and electrical activity reversed. "The findings of this research have implications for our understanding of what causes people to stop exercising. "The next step is to see what causes these measures to be reversed when we motivate people and why that allows us to keep exercising." The research at the University's exercise and sport science laboratories in Bathurst used electroencephalogram (EEG) to measure brain electrical activity; and electromyography (EMG) and near-infrared spectroscopy (NIRS) to examine blood flow and oxygen availability. This is relatively new area of research, made possible by the recent development of the technology to carry out an EEG on a person while they are exercising. In a separate study, PhD graduate, Dr Nicole Vargas explored the roles of different body systems, how they interact together during exercise to contribute to feelings of fatigue. Dr Vargas said her research focused specifically on interleukin-6, a bio-marker released during exercise as a signal for the brain to alter behaviour. "The results from the studies revealed no specific significant correlation between interleukin-6 and performance during the exercise tasks. "However, they do provide an overall representation of physiological responses and behavioural modifications that occur during self-paced exercise. "These findings may help us understand more about human performance and how feelings of fatigue act as an overall protective mechanism," Dr Vargas said. Head of the School of Exercise Science, Sport and Health, Professor Frank Marino, said, "These studies along with several others in the School are cutting edge. "They provide us with greater understanding of human endurance. "This is important as it has implications not only for high level performance but also for how we use exercise as a therapy instead of using a pharmacological intervention." 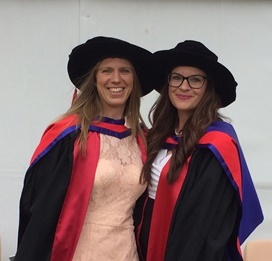 Dr Vargas and Dr Robertson were awarded their PhD's during a graduation ceremony in Bathurst in December 2016. Media are invited to interview Dr Nicole Vargas and Dr Caroline Robertson at 10am on Wednesday 15 February at the Exercise Science Laboratory, building S21, near car park 7 off Minnibah Place at CSU in Bathurst. See map here. Contact CSU Media to attend.